National Book Award-winning author Joyce Carol Oates has penned over forty-five novels, numerous collections of short stories and over fifteen non-fiction titles. When she isn’t writing she teaches Creative Writing at Princeton University. 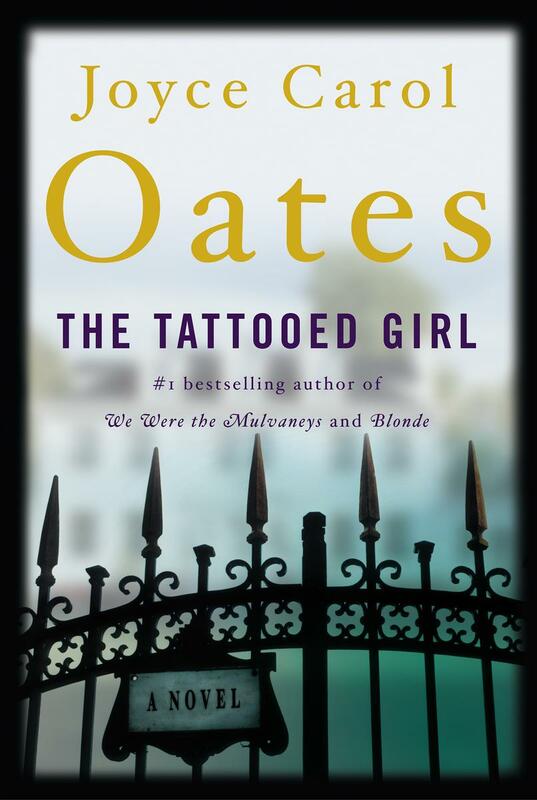 Her novel The Tattooed Girl was originally published in the UK in 2004 by Harper Perennial. The first man to truly see The Tattooed Girl when she arrived in the hilly suburb of Carmel Heights, Rochester is a waiter, Dmitri. He watches as she sits at a table still dirty with plates and cutlery from its previous occupants. He’s seen girls like her before but still admires her subtlety as she pretends to feed the birds with the leftover bread, a less keen eye would never have seen her occasionally popping bread into her own mouth. He sees a beautiful young lady covered with the faintest of tattoos, they’re of no real design but cover the backs of her hands and there’s one on her face. What he also sees is a victim, one he can take full advantage of. At first, he feeds her, baths her, tells her he loves her but before long he’s drugging her up and whoring her out just as he planned all along. Broken and abused she still thinks it’s love and begs him to let her bring in money another way. Against Dmitri’s wishes, she gets a job at the local bookshop, where the second man truly sees her. When Seigl hears the bookshop manager berating his latest employee it doesn’t surprise him but the face of the new employee does. Beautiful yet cheap looking, with either a tattoo or birthmark disfiguring her face he can’t help but stare. For the past few days, Seigl had been interviewing the sharpest young minds in the area to potentially become his home and literary assistant. After turning down these great minds he shocks himself by asking the unusual yet obviously uneducated girl to work for him. She timidly agrees, looking forward to taking the extra pay home to Dmitri. She despises her new employer, a man pretending to healthy, wasting his days writing and flittering his inherited fortune away on eccentricities. Dmitiri’s also told her that Seigl’s a Jew, something she should hate, so she does. She’s filled with hate at how he has everything she’s never had and doesn’t even realise it. Why does he quietly request her to carry out tasks, why doesn’t he just tell her like everyone else? The Tattooed Girl is a beautiful yet brutal story of a woman finding self-worth and a man facing his fear of vulnerability. The tattoos the girl is covered with are not the works of art that would pop to mind in current times but the scarring of an abusive act, a new skin she barely survived. The way Oates constructs her desecrated personality is heartbreaking but the bitterness she contains also often makes her unlikable until you remember why she’s that way. Seigl is a man uncomfortable with his money and his age, feeling the constraints of both, afraid of his youth slipping away but also seeming old beyond his years. With characters that will have you hot with fury and sad with pity, it is these two people and the complicated and changing relationship they have that makes this novel such a joy to read. With this style of plot, you may wonder if this all ends in a fluffy and predictable fairytale ending and it is safe to say that this novel is nowhere near that mainstream and the final pages wrap up a story as dark as it is poignant.